What Weather Can You Expect on your Ecuador Holiday? Ecuador's location right on the equator means that summer and winter don't have a great deal of meaning, but the change from the wet and dry season can make a huge difference to your holiday in Ecuador, and the wildly different altitudes can have a huge bearing on temperatures as well as the climate in general. The three main climate zones in Ecuador cover the Pacific Coast and lowlands, the Andes mountains that run right down the spine of Ecuador, and the low Amazon basin in the east of the country. 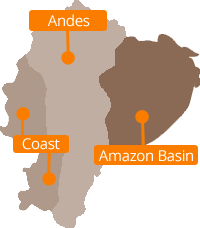 The coast and Amazon are both characterised by hot, humid weather with high rainfall more or less year-round. In the mountains the rainy season is more pronounced and the climate is generally more temperate. The rainy season in the Andes runs from roughly October through to April, although rainfall actually drops quite a bit in December and January. In general, we'd say the best time to visit is from May to September, when the skies are clear and you can enjoy the mountains and lovely colonial towns like Quito and Cuenca in all their sunlit glory. The tropical Amazon rainforest climate means hot and humid conditions throughout the year. The main rainy season runs from May through to July, but because you're likely to see significant rain at any time, don't let that put you off - you can include a trip into the jungle no matter what time of year you are visiting Ecuador.